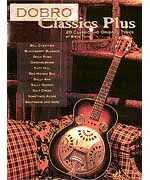 20 Classic and Original Tunes by Steve Toth Centerstream Publishing A collection of 20 classic Dobro tunes likely to come up in jam sessions, incorporating the sounds and styles developed by the masters. Focuses primarily on up-tempo tunes, with 5 of Steve Toth's original instrumentals. Includes: Bill Cheatham - Blackberry Blossom - Daybreak In Dixie - Gold Rush - Katy Hill - Sally Goodin - Step To It - and more. Includes an explanation of tablature.